Better Late Than Never, Albies! They took a little while to get here this year, but that's okay. Now that they're around in great numbers, it's party time! 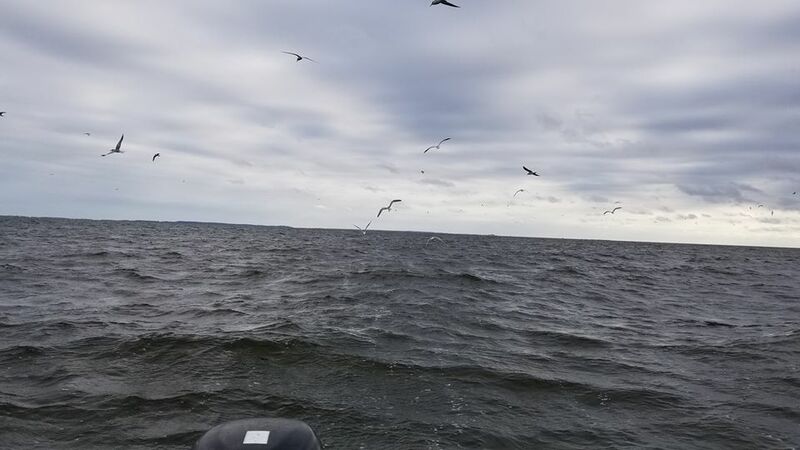 False albacore don't migrate up and down the coast like striped bass do. There's no "albie run". There is no question that the baitfish run effects their appearance, but that's different. They come in from the gulf stream when conditions suit them, and sometimes they don't. Albies are never a sure bet, one year there can seemingly be thousands out there every week from the September even into November, one year they may show later a leave earlier, and one year they may not show at all. Four years ago albies legitimately never showed up in CT or RI. None. Zip. Zero. Zilch. With September 15th rolling by with little more than sporadic albie activity in RI and little to no activity in CT, I was thinking this would be a mediocre season. Well, I was wrong. And to that I say, better late than never, false albacore! For almost a week the fish were all over the place and I wasn't really able to get after them, unlike last year where I was one of the first guys out there and got a fish on the very first day I tried. Patrick Barone and I ignored the small craft advisory on Monday to chase albies. He had a few good days targeting them already, I had not. I was desperate to get one before going to Montana, partly because the weather on either side of my trip is much worse than the weather during it... of course. Regardless, neither of us are fair weather fisherman. It's a good thing we aren't the albies were everywhere. We really pretty much found some amount of false albacore in every cove. They were definitely favoring backwaters, likely because the bait was all sheltering there. We found some right in a bunch of moored sail boats, which would have been a heck of a lot of fun had we hooked any. Patrick got the skunk off the boat really quickly. It took a while for me to connect, and it was on a spinning rod, but boy did it feel good to get the first of the year. Eventually we were in them really well, just surrounded by feeding schools. Just because you're surrounded by albies doesn't mean it is easy to catch them. To make things harder on myself, after I got one more on the epoxy jig I decided to commit to the fly. There were a few fairly prolonged chaotic blitzes that I totally screwed the pooch in. I can cast in the wind, accuracy and distance weren't a huge problem. But I didn't bring my stripping basket so my line was blowing all over and tangling either in itself or on various extremities of the boat. All the while Patrick was getting fish on spinning gear, which made it very hard to resist just picking that rod back up. Eventually though I hooked up. The line tangled around the trolling motor and Patrick and I both struggled to free it while I gave the fish minimal pressure. Throughout much of the fight, the harder you pull the harder the fish pulls. By keeping a steep rod angle and giving as much slack as I could I kept what I thought was a worked up albie from tearing off like, well, a worked up albie. Well, when we got it to the boat we really knew why it had been so manageable. It was a bluegish. Patrick and I had both already caught one striper each. 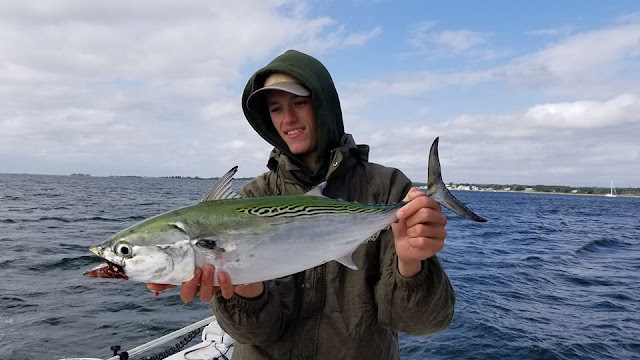 Not much after I got my bluefish Patrick got one too, so we both had the inshore slam going. The fish started to disperse a bit as the tide got close to low. we drifted out further than we had been before, and although I wasn't seeing much fish surfacing I kept casting and casting hoping for a tug of the right kind. Then, out of nowhere, an albie ate my little pink surf candy right by the boat. 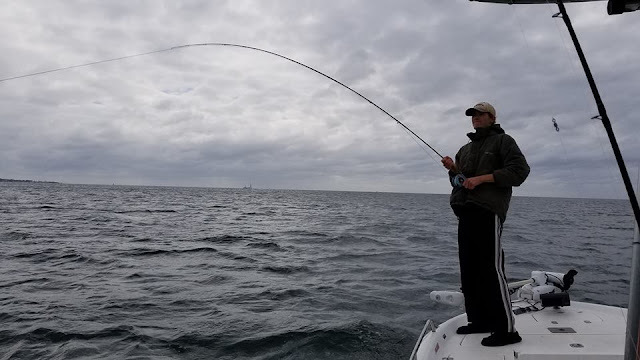 It took most of the trip, but I finally got one on the fly. Thanks Patrick for being crazy enough to fish on such a gnarly day, it's always a pleasure. I'm sure this won't be our last adventure this season. I'll be out again after these oh so seductive light tackle speedsters at least once more before I leave. Whether I find the time to write about it or not is a whole other thing. Expect posts to be short an sweet until next week. Then they should be long and full of fantastic photos, and I'm not just talking about Montana. The fall run is upon us, and it truly has become what I live for. My heart beats for the blitz. After last week, I'll take whatever help the carp are willing to give me. So, when one presented itself in an almost too easy position I took the shot with pleasure. Simple drag and drop, immediate take, easy hook set, run of the mill fight, beautiful healthy carp on the bank. What's the best practice though, for someone who legitimately needs it? The hardest fish in the lake. The one under than overhanging bush. The one in clear water, eyes practically above the surface. The one that has been caught before. I was very proud of my ability to deconstruct a feeding carp's behavior for some a long time, even ones that I couldn't directly see. How did I lose that skill? I didn't see as many feeding carp for a year and a half. The only way to get all that back is hard, frustrating, time consuming effort. Is it worth it? Hell yes. I like to go out and hone my skills before any big trip, especially with trout. This is particularly paramount before my upcoming trip because it was best for us (my dad and I) to ship our gear to our destination before hand. For the first time in my life I'm going to be flying to get to my destination. Montana. Oh yeah. This one has been a long time coming. Anyway, I wanted to get a little bit of practice in before going to the mountain west. On Thursday I fished my home river. This time of year is odd there. The fishing is probably the toughest it can be here, excepting winter ice lock and drought conditions. The water can be flowing very well and at the perfect temperature, I still struggle to locate good numbers and good sizes of wild browns. Often though this is when the less common brookies come out of the woodwork. That didn't happen this time. Salmon parr and small browns provided some practice with attractor dries and small streamers. This morning I joined Mike Carl on a morning trip to the Farmington. We had chosen a time frame after some rain passed over a less convenient nocturnal time window before the rain. In retrospect, we almost certainly missed an excellent bite before the frontal passage. We got on the river well before sunrise and both fished different methods that should have produced. They didn't, almost certainly because the bite window had come and gone well before we got there. It wasn't until the sky started to brighten that I moved the first fish, on a fly I tied with a combination of traits from Joe Cermele's Master Splinter and Jackie Treehorn's Dirty Rat. I dub the, the Marabou Mouse. The fish I moved probably wasn't big, because I heard but didn't feel the take. A large taker is often the opposite: felt but not heard. I then bounced between fishing a Sparkle Minnow and a pair of nymphs, with no interest on either. Eventually I threw on a more neutrally buoyant articulated fly. On the first cast it got slammed pretty much at the rod tip. On the fifth cast I hooked and landed a handsome young wild brown. Then, back where we started, I got the best streamer take I've had in the Farmington in a long time. Lots of the trout there are, well, sissies. They grab and nip rather than slam. This guy slammed. He was a big fat survivor strain fish. No elastomer, just a clipped adipose. So I had one really solid fish on the morning, certainly no 20 incher but nice fat brown. Mike decided to show me some new water. I am never one to refuse to fish a new place, I was into the idea immediately. I already new the section we were going to had big fish potential, though undoubtedly it would hold fewer trout than many parts of the river. You know what? Those are the pieces I like most. I tend to believe that the biggest trout live where there aren't as many trout. And in time, this stretch would prove to be some place I have to fish again. I got a solid off hits right away, mostly I think mid sized rainbows. Eventually I got one pinned and landed it, a crisp and clean holdover. There seemed to be a pod of fish hanging around right where we started. I caught that bow, hooked and lost one other, and got two smallmouth there. I also missed an exceptionally large smallie and lost a questionable fish. The take and late hookset felt like I may have fouled the fish. The brief fight also indicated that either it was excessively big, or snagged. I'll never know for sure, but I'm sticking with snagged fish because that's the type I'd rather have had come off. Working upstream though I had a take for which there was no question: it was excessively big. It was a little unexpected. I was twitching my streamer in front of a partially submerged log that was being bonced up and down by the force of the current. I thought it would be odd for a trout to tolerate lying close something moving constantly and making noise, but a large, very thick, kyped up buck rose up and shadowed the fly for five feet up and across stream in heavy current, tip of his snout just glued to the tail of that streamer. Do you know how many times a legitimately large wild brown like this actually eat the big streamer after a follow of this kind? In my experience it is very uncommon. This one broke the rule and slammed the fly hard. I set as well as I could, and was treated to four of five seconds of violent thrashing, the big trout sending spray high into the air, before the line went slack. My heart sank. I had to take a short. There wasn't really much I could do in that scenario. 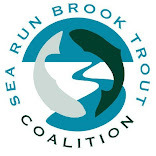 But as anyone that plays the game of big trout on large streamers knows, missing and loosing fish is to be expected and, if you know it couldn't be avoided, not to be sweated. I continued working the waters with even more focus and intent than I had before because I now didn't just have a hunch, I was certain there were big fish here and that my method was the right one. Time and energy were not on our side though. I got one smaller brown in a pool tailout before succumbing to my lack of sleep. It is rare that I am the one to reel up first, today I did so. How many times can you mess up before you start to get really frustrated? I'm pretty patient, but I have a limit. I haven't broken gear over lost fish but I have gotten pretty upset over a few particularly exceptional missed or blown opportunities. If seems petty to get worked up over fish missed or lost, well, you probably aren't as engrossed in this sport as some of us. Carp have been giving me the slip lately, big time. It's not them either, it's me. It's usually blamable on their neurotic behavior. Not this time. And today I got all pissed off. Last night presented great conditions. It was the calm after the storm, the remnants of Florence had passed through with a little tiny bit of wind and a fair amount of rain and thunderstorms. Things were primed for a good backwater bite. I got to my spot, saw a bubbler, made a less then optimal cast in its vicinity, and was taken aback when the fish actually ate. It's important to note that I had left home with the rod already rigged. I had no clue what shape my tippet was in from the last time I had used it, but I was happy with the fly that was already on there so I wasted no time and just took it off the hook keeper and made the cast at that fish. Do not follow my lead! That fish broke me off with minimal pressure and I was left standing on the bank cursing my own stupidity. I went over to the other side of the bridge and found a big tailing fish, a perfect target. My first presentation was much too far ahead of her. I overcompensated for the next one and lined her, spooking her hard. a little further up the creek another fish was working. I tried to be more careful this time, worked out what I thought would be a good angle. I didn't give it enough time and cast over the fish's back, something I know not to do. When the fish tailed up I though it had eaten and set the hook. Two chaotic seconds later I was standing there staring at a big golden scale on my hook point, a clear sign that the fish was foul hooked and hadn't actually eaten. Strike three. I was out. Realistically I should have gotten all three of those fish, they were practically begging to be caught. I hoped to redeem my game this morning. Given how beautiful it was out last night I expected near perfect conditions. When I stepped outside just before sunrise I discovered the I uttered an unfortunate question: "what the ____ happened?" There was a persistent northerly wind. My options were going to be very, very limited. When I got to the first of two places I'd have a realistic shot in, I found a big girl feeding with most of her back out of the water. I was pretty gun shy from the previous night's calamities, and that was my downfall with this prime target. I didn't want to line her like I did the two fish before, so I erred too far outside her dinner plate. I snagged up on a branch after 10 casts that were really sheepish, stand offish, and lame. The fish spooked and I didn't get another shot there or anywhere else. I used to be really good at this. Not to toot my own horn, but up until last summer I think I could go head to head with some of the best fly carpers out there and at least come up even.What happened? I lost the touch. I stopped exercising the muscle. I haven't fished for the like I used to, and I'm the worse for it. Am I being hard on myself? I don't think so. I know a catch-able carp when I see it, and I know 2016 Rowan would have just torn it up last night and caught three, maybe four big carp. Fall 2018 Rowan just isn't as good at this anymore and needs some practice. So you know to expect some more funny titles soon. I've got a bunch of music and literature carp puns running through my head that need to be seen. They say the biggest fish feed nocturnally. Giant brown trout. Hawg largemouth. 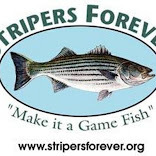 Cow stripers. Many fisherman night fish because of the notion that it is the time of big fish. And, sometimes, it is. But there comes a time when most realize that night fishing is about getting lost and fading into the scene. Maybe I night fish because I sometimes wish nobody could see me. There's nothing wrong with being a ghost. For life list anglers there is no such thing as "trash fish", no such thing as "too small", and no fish species isn't worth the effort to catch. I'm not the average life lister: to get on my list a species has to be on the fly. No live or dead bait. Most would think that small fish are the easiest fish to catch. Well, they aren't. Especially not on artificial flies. Though many "micros" are quite common, it sometimes takes many attempts to catch one. For me, striped killifish and sheepshead minnows fall into that category. I'd targeted them numerous times and failed to catch them because other species got in the way, they were to skittish, or they simply never got the fly well enough for a proper hookup. Over this weekend I would successfully get both, and one other new species. On Friday I got a bit of time in fishing the margins of an estuary which, like any healthy estuary, was just teaming with life. My confidence was high that I'd get a new species or two. I started out fishing my typical rig for small species: a size 22 midge tipped with a bit of soft plastic on the bend and one small shot just ahead of the fly on 5x tippet. Initially, I caught a bunch of two familiar species: mummichogs and banded killifsih. Then I got what I was looking for. Lifelist fish #88, striped killifish. I kept targeting them, hoping to get both a male and female example to photograph (male and female striper killies have drastically different patterns) but all I could get were males. I was also plagued by Atlantic silversides. I examined each one though, hoping to see the slight variation that determined I had caught an inland silverside. I never did. I also got a couple tiny scup that did not want to be photographed. Walking through the marsh I examined each mosquito ditches. You never know what you'll find in one of those. Today it was needlefish. Eventually I found a ton of them stacked at the mouth of one larger mosquito ditch. Catching one turned out to be a frustrating cast, which was predictable. Like gar these little guys have very bony jaws, getting a hook to penetrate is very difficult. Eventually I found a winning method: a midge trailed just inches behind a green weenie. The needlefish attacked the green weenie and, when I was lucky, got hooked by the midge. I caught a bunch. Lifer #89, Atlantic needlefish. The next day Noah and I visited the same water to get him these species. I also wanted to give sheepshead minnows a better shot. We both fished much the same manner, with small, plastic tipped midge flies, and caught a bunch of killifish. I finally got some female striped killies,. Interestingly there seemed to be as many of them as males this time. I wonder why their representation was so poor on the same tide the day before? There may not be a real answer to that. Noah's lifer striped killie. A very distinctly patterned female. 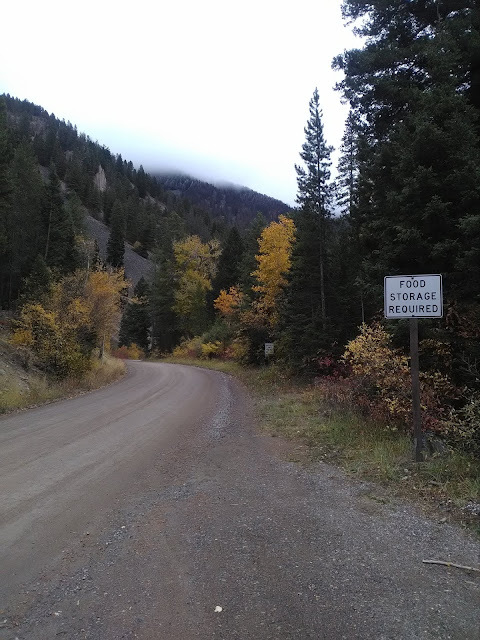 Then I hit paydirt. A fat little marble of a fish took the midge and I somehow hooked it. My sheepshead minnow! Life list fish #90. Hitting another benchmark. I am now almost certainly going to break 100 by the end of this year. We then went to get Noah his needlefish. It took a while, and in the process I caught a bunch more for myself. They are fun little fish with big personalities. I don't think I'd specifically go out of my way to target them again, not this species (there are a bunch more needlefish species out there), but they are hilarious little fish. After Noah got a couple Atlantic needlefish we went back to targeting real micros again hoping he could get his own sheepshead minnow. It didn't work: I caught the only other one! As the sun started to sink I knew there was a fair chanc we'd have a good window for getting some bass. We did find some, though not where I'd hoped and not as big as I'd hoped. There were schoolie fish ranging throughout the river. We both got a few, none particularly large but all very healthy fish. As we were paddling back to the take out we spooked a bunch on the mud flats. What they were feeding on there is anyone's guess. I only got one, on a hollow fly dragging behind the kayak. They might have been on crabs. 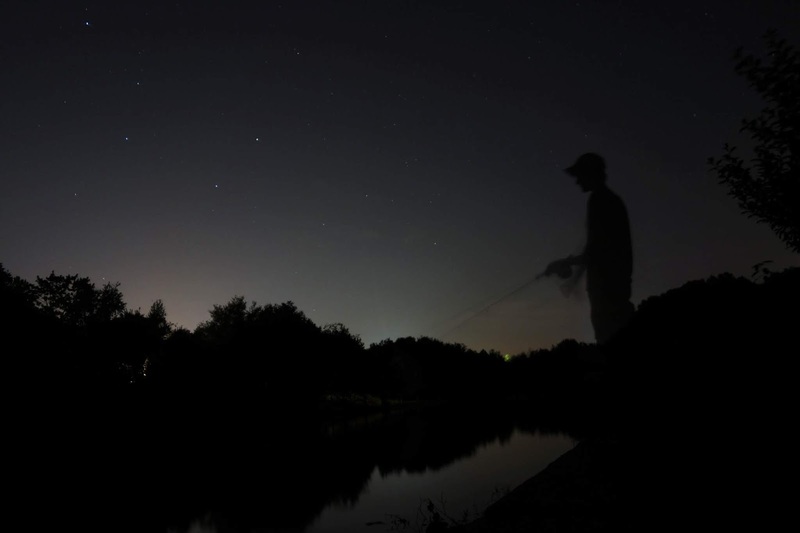 The fact that it was dark negated effective sight fishing entirely. I don't think any were very big so it wasn't much of a loss. Very near the take out I took the time to examine a rocky area with my flashlight. Aside from millions of grass shrimp, their eyes glowing orange, there were a couple odd fish around. Two were something I cannot identify. They were somewhat sculpin-like but to the best of my knowledge don't match any specie of sculpin in Long Island Sound. I may never know, there were only two on one specific rock. I did catch one little oddball there, a tiny oyster toadfish! The life lister has to put a lot of effort into persuing their query. You have to be a polymaths. A jack of all trades. I can't just do what every angler knows and expect to catch every species on earth. Micro fishing may seem dull, unglamorous, and much of the time it is. But if you really care about fish you don't need to have one scream drag or get into the backing. That's thrilling, and I'll never bore of it. But I think those that get a thrill out of biology can probably get the most out of fishing: They see the big picture of these little things. Some of you may look above and see photos of fish you don't care about because they are all so small. But some will see works of art. The oyster toad, with its amazing camouflage; the needlefish, with its sleek build and mouth, perfect or eating tiny baitfish; the sheepshead minnows' and killies' abilities to sift sift through bottom materials for food. These fish are the products of millions of years of evolution. Though they don't excite me as gamefish like a sailfish or tuna would, they are no less fascinating or beautiful as parts of the natural world. And that's I won't rest until I've caught every species that I possibly can. If you enjoy what I'm doing here, please share and comment. It is increasingly difficult to maintain this blog under dwindling readership. What best keeps me going so is knowing that I am engaging people and getting them interested in different aspects of fly fishing, the natural world, and art. Follow, like on Facebook, share wherever, comment wherever. Every little bit is appreciated! Thanks for joining the adventure, and tight lines.